Theatre Orchard is North Somerset based project which is “shaping the arts landscape in North Somerset. Theatre Orchard seed performing arts projects throughout the region to grow community, creativity and skills.” I’ve been involved with the project since 2007 documenting many of their productions [links to come], designing publicity material and advising as a Board member. One of Theatre Orchard’s (many!) success stories is the work they’ve been doing in the Bournville area of Weston-super-Mare for the last 5 years which has resulted in the formation of BoCo – The Bournville Community Theatre Company who devised and performed a Christmas show about their neighbourhood called ‘The Ballad of the Bournville’. 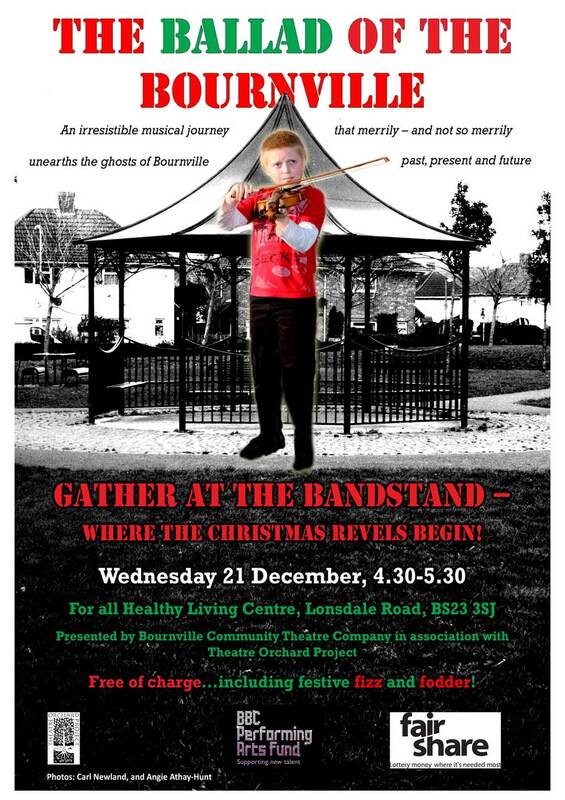 The brief for the poster (above) I designed was to create a ‘Festive feel’ using the two photographs provided of local a lad and a local landmark – both of which featured in the show! It was a promenade production supported by the BBC Performing Arts Fund, created and performed by BoCo and produced by Theatre Orchard Project. Originally scheduled for 21st December it had to be postponed due to the unfortunate arrival of the Norovirus bug amongst most of the cast! By January the Company had recovered and the piece was performed on 21st January in and around the Healthy Living Centre – you can see some photos of the performance over on Theatre Orchard’s flickr pages. This entry was posted in Design, Work and tagged North Somerset, performance, The Theatre Orchard, Weston-super-Mare. Bookmark the permalink.